This railway bridge dates back to the British colonial era. While Inle Lake and Bagan may be better known to foreign tourists in Myanmar, the former British hill station of Kalaw in western Shan State is getting an increasing number of rave reviews. Dutch tourist Joost Van Der Velden told The Global New Light of Myanmar that the three-day trek he did from Kalaw to Inle Lake was the highlight of his month-long visit to Myanmar. “It was an amazing experience – it was the best thing I did,” the 23-year-old said while sipping a Myanmar beer at Yangon’s Motherland Inn 2 Guesthouse on the evening before he flew home. According to data from the Ministry of Hotels and Tourism, a significant number of tourists are seeking out the pleasures of Kalaw – which include a temperate climate, forest pines, a gaggle of colonial buildings and diverse cuisine. Between January and October 2015, almost 13,000 foreign tourists visited the area. A few years ago, the number would have been but a fraction of that (as admittedly would have been the case everywhere) – however with the latest edition of Lonely Planet (2014) rating Kalaw as one of the country’s highlights, it seems certain to attract an increasing stream of curious visitors. Having a quick bite of lunch at busy Kalaw market. Mr Van Der Velden was travelling solo through Myanmar but he was among a group of five trekkers – three of whom were also foreign tourists, plus a guide called Uncle Sam of Uncle Sam’s Treks, which is a family-run company based in Kalaw. The three-day trek includes six hours of trekking on the first day, followed by seven hours on the second – and it’s literally all downhill from there, Mr Van Der Velden said. While it may sound like a lot of legwork, Mr Van Der Velden insisted that the terrain isn’t too tough. Kalaw is the only place in Myanmar where foreigners are permitted to do overnight treks. 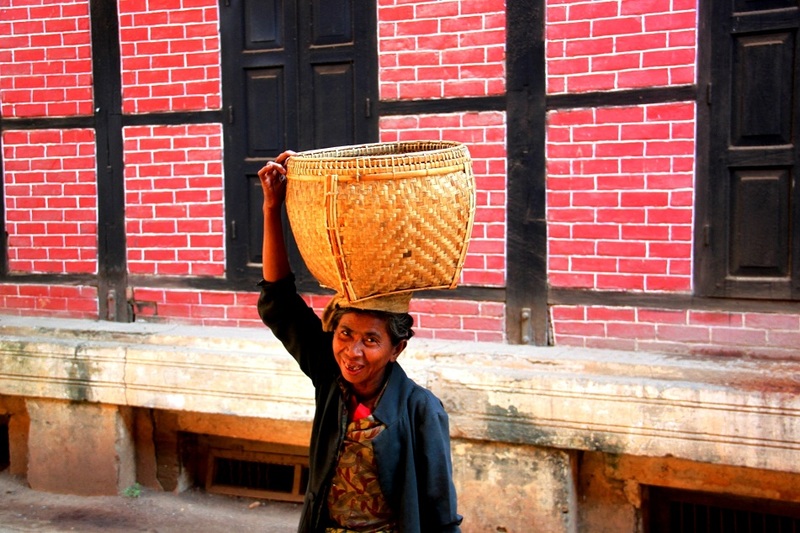 Uncle Sam’s Treks arranges for guests to spend two nights in villages inhabited by different ethnic minority groups, which in the region include the Palaung, Danu, Pa-O, Taung Yo and Danaw tribes. Can’t say I fancied eel sticks for lunch though! “Uncle Sam was the sweetest, most gentle guy. He’s quite old, I guess. He said to us, ‘Please stop to enjoy what the locals say and hear their stories,” Mr Van Der Velden said. However he said one aspect of the trip – which included accommodation and meals and cost just K38,000 – was somewhat disappointing. “The countryside in Kalaw is very different from the Netherlands, where it’s very flat. I’d really wanted to see a snake as I’ve never seen one before. Unfortunately that didn’t happen,” he said with a shrug. 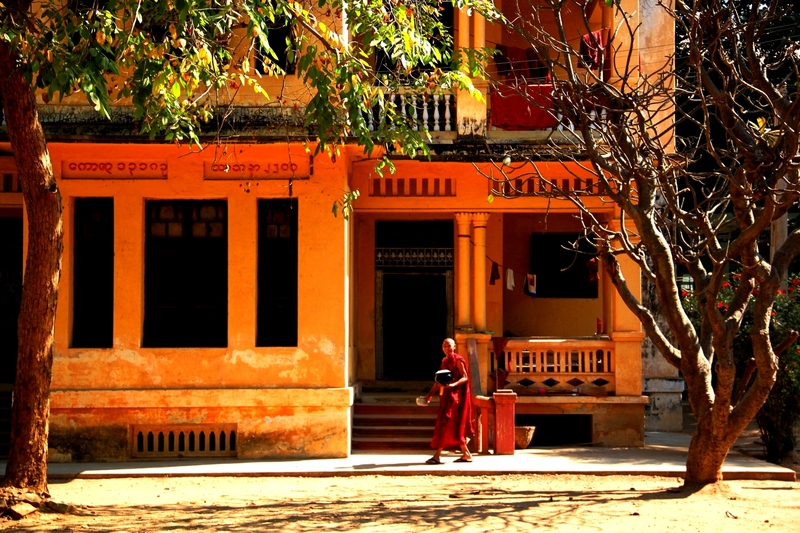 After arriving in Inle Lake by boat, Mr Van Der Velden caught the bus to Bagan. “Bagan is already a bit too touristy. The trek was authentic. Mandalay? That was my least favourite place – it’s humid, crowded, a bit dirty and it’s hard to find a good restaurant. Although Yangon is a big city, the people are really friendly and were so helpful to me whenever I got lost,” he said. For those who still remain opposed to the idea of trekking and sleeping in basic surrounds – or are simply time poor – visiting Kalaw as a day trip from the Shan State capital of Taunggyi is perfectly possible. I set off at around 10am and was ready to catch my flight back to Yangon from Heho airport by 5pm that same day. My guide and driver was Ko Japan, who charged K60,000 for a day of sightseeing in the comforts of his air-conditioned saloon (which in retrospect, seems a bit pricey). Incidentally, Ko Japan nicknamed himself after his favourite country – though his dream of visiting Japan is yet to materialise. He drove carefully and wasn’t a chatterer, but boy did he have a couple of great tales. “Back in the sixties – I’m not sure which year exactly – the Russians built a new hospital in Shan State. They gave it to Myanmar as a gift and even staffed it with Russian doctors. One day, the doctors got a call saying that some very important soldiers in Myanmar’s army had fallen ill. Coincidentally, on the day I travelled to Kalaw, a pair of bandits were on the loose after escaping from police in a style not dissimilar to a Hollywood Western. After being sentenced for drug trafficking the day before, the two men were being driven in a police van to the cells that awaited them. The vehicle was ambushed by members of their gang brandishing weapons and the police had no choice but to set them free or risk losing their lives. Police checks lined the roads every few kilometers or so (which were lined by an outrageous number of Ooredoo and Telenor posters), although Ko Japan told me he suspected the duo had already made it over the border to Thailand. When I looked at him incredulously, he said: “It would take a long time [to reach Thailand] by road, but though the jungle it’s not far at all,” he said. We stopped by the side of the road as our timing coincided with the passing of a train across a bridge. We could hear the diesel train chugging for minutes before it came into view from a side bend and may its way across a skinny bridge surrounded by lush jungle. “It has to be the world’s slowest train,” muttered Ko Japan. His comment seems fair – the journey from Yangon to Mandalay takes a full 24 hours. For some it’s the only viable route if they cannot afford to fork out on a more costly bus ticket. 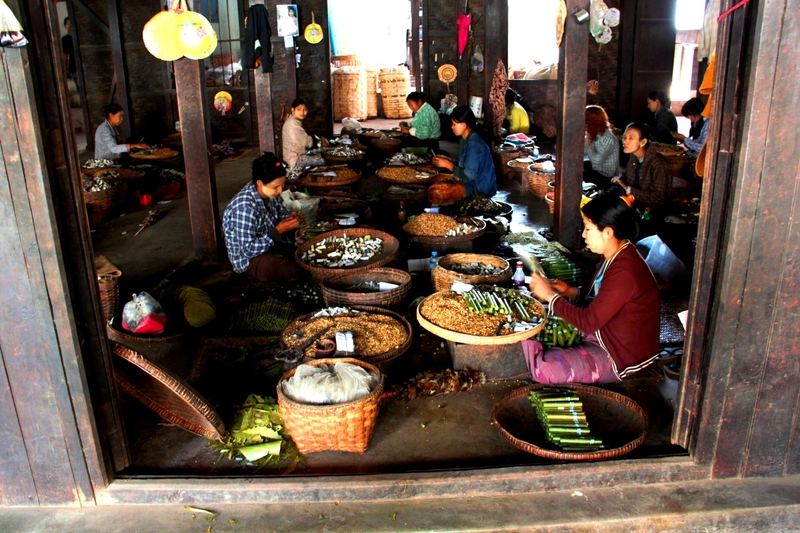 As soon as we arrived in Kalaw, I went camera-in-hand to the central market, which teems with life and colour. Live eels squiggled on wood-worn tables, chunks of meat were diced into tiny pieces by women dexterously wielding machetes, and the array of spices, flowers and fresh produce was mind-boggling. I strolled around the pretty and quaint streets for 45 minutes or so before my appetite got the better of me and I returned to Ko Japan’s car. On my request, he dropped me out of the front of Everest Nepali Restaurant – which is right opposite Uncle Sam’s Treks (which also has a restaurant). The restaurant isn’t as out of place as it sounds. Kalaw was founded as a hill station by British civil servants fleeing the heat of the plains during colonial rule, and while the Brits may have left, there remain a significant number of Nepali Gurkas and Indian Hindus, Sikhs and Muslims, who were brought to Kalaw to build roads and the railway line during the British colonial era (which ended in 1948 when Myanmar regained independence). Fortunately, their culinary traditions have been well kept, with recipes handed down from generation to generation. I had high hopes for my meal as I’d been to Everest’s ‘sister’ restaurant in the tourist town of Nyaung U in Inle Lake. In short, it certainly didn’t disappoint, although the décor could have done with a few less buckets of bright orange paint. Or perhaps it was right on the mark, as my lasting impression of my fleeting visit to Kalaw is one big riot of colour. Despite the abundance of domestic airlines in Myanmar, there’s surprisingly little variation between them. Aircraft models, flight routes, fares and schedules are virtually indistinguishable, and the onboard service is often mediocre. However one of the newest of the 10 airlines, FMI Air, is making a concerted effort to stand out from the pack. “We’ve remodelled the whole experience of flying: we provide a business class service on all our flights,” said Trevor Jensen, the Chief Executive Officer of FMI Air. 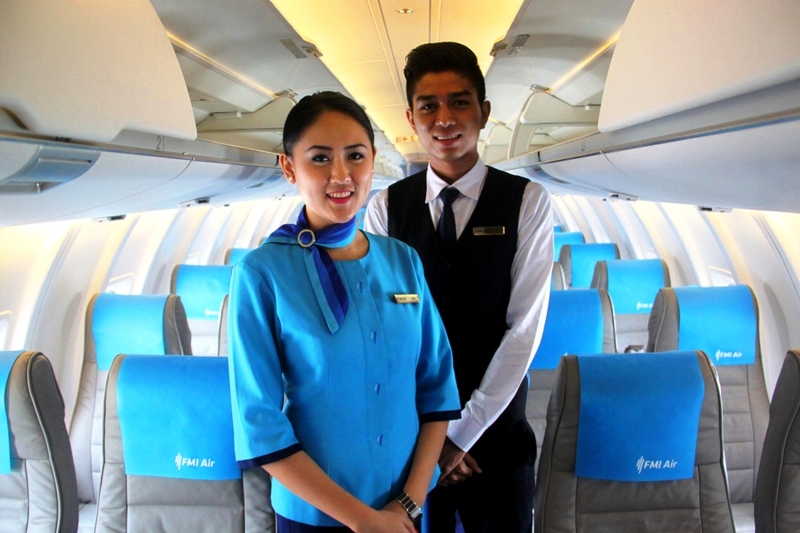 The airline was launched as a charter flight service three years ago and began offering scheduled flights on May 4. It boasts a fleet of three Canadian-made Bombardier jets, which seat 50 passengers and reach significantly higher speeds than the ATR turbo props used by other operators. “Our jets are very comfortable, fast and modern. The CRJ100 has been used extensively throughout Europe and the United States as a city commuter jet and it’s a well established aircraft,” said Mr Jensen, whose career in aviation began in the 1960s as a captain at Australia’s Qantas. The Bombardier jets are also comparatively quieter and fly at higher altitudes: while the ubiquitous ATRs fly at around 14,000 feet, the Bombardiers cruise at 22,000 feet. 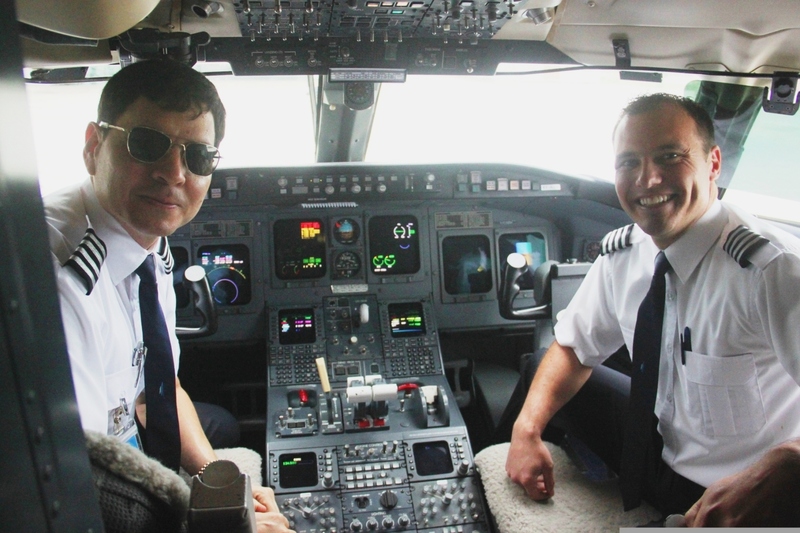 “This means that it’s a more comfortable flight because the aircraft gets above low level turbulence,” Mr Jensen said. “Quite frankly, at this time of year, you can’t out-climb all the turbulence, but it is definitely smoother on a Bombardier,” he added, referring to Myanmar’s powerful monsoon season. The airline’s 12 pilots are expatriates, although a Myanmar national is in the process of being recruited, while the 22 cabin crew staff have undergone an extensive training programme and some having prior experience on top tier airlines such as Qatar Airways. “In my whole career, I’ve never worked with a more professional and well trained group of people. Our cabin crew are absolutely fabulous,” Mr Jensen said with a grin. FMI Air currently operates five flights a day between Yangon and the administrative capital of Nay Pyi Taw, where the airline is based. A one way flight between Yangon and Nay Pyi Taw costs between US$120 and $180, which makes it pricier than its competitors. However Mr Jensen maintains that FMI Air offers excellent value for money. A complimentary invitation to a business lounge is provided with every boarding pass, which means that passengers can avoid the dreary and noisy departure lounges in Yangon’s domestic terminal (not to mention negating the need for the airline colour-coded stickers passengers don to ensure they are herded onto their respective flights). FMI Air’s seats are of business class proportions and the onboard meals are provided by two five-star catering companies. The juice served is seasonal and freshly squeezed and meals are rotated frequently to avoid boring the palates of its passengers. FMI will start operating flights to Mandalay on July 1, with Sittwe following suit in mid-July. 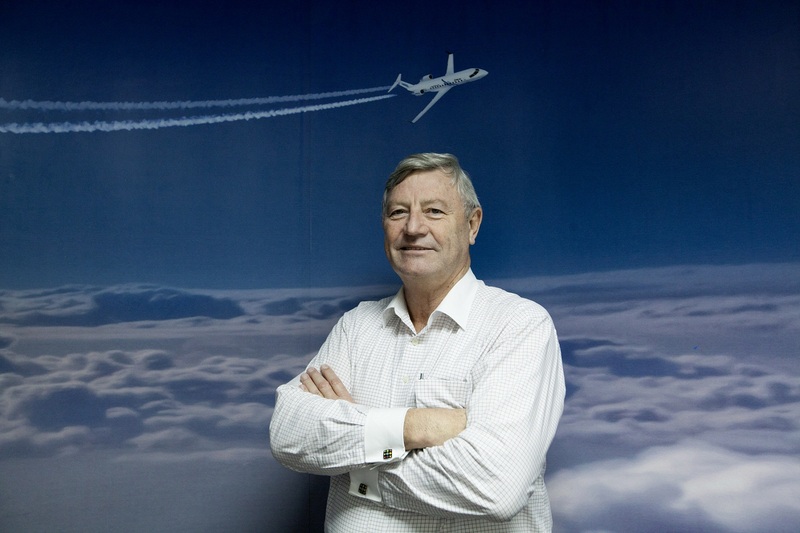 Plans are also in the pipeline to launch international flights, with the ambition of becoming “the region’s premier airline,” Mr Jensen told Myanmore. To date, FMI Air is the only airline that allows flights to be booked online using credit cards and its operations control room is the most sophisticated in the country. “We always know exactly where our planes are in the sky, which cannot be said of other local airlines,” said Jeremy Kingston, FMI Air’s manager of system operations control. Mr Jensen told Myanmore that FMI Air is also “in total support” with the Ministry of Transport’s ambition to restore Myanmar as a regional aviation hub. For those uninitiated with aviation technology, Maestro is a web based application designed to enhance personnel and management systems and help airlines better achieve compliance with safety and operational standards, which in Myanmar have known to be sadly lacking. However it seems that with FMI Air raising the bar, things are on the up in Myanmar’s aviation industry. For those wanting to get off the proverbial beaten track after spending a few days in the tourist mecca of Bagan, set aside a short trip to the small town of Pakokku. It’s just an hour’s drive away from Bagan, but aside from the odd abandoned temple decaying in Pakokku’s tobacco fields, the two places have nothing in common (except, of course, for the pounding dry heat common to central Myanmar). Pakokku lies along the Ayeyarwady River in Magway Region and a recently constructed bridge across the river – which is the country’s longest – makes getting there a cinch. It’s also possible to take a scenic ferry ride to or from Bagan’s Nyaung U, or an onward bus to Monywa. My husband and I booked a driver-slash-guide in Bagan at a cost of $40. The land surrounding Ayeyarwady River is exceptionally fertile: field upon field is used to cultivate tobacco, cotton, rice, chilli, peanuts and even sesame. Harvested tobacco is most often used to create traditional cigars, which are known as cheroots and emit a surprisingly pleasant aroma when lit. 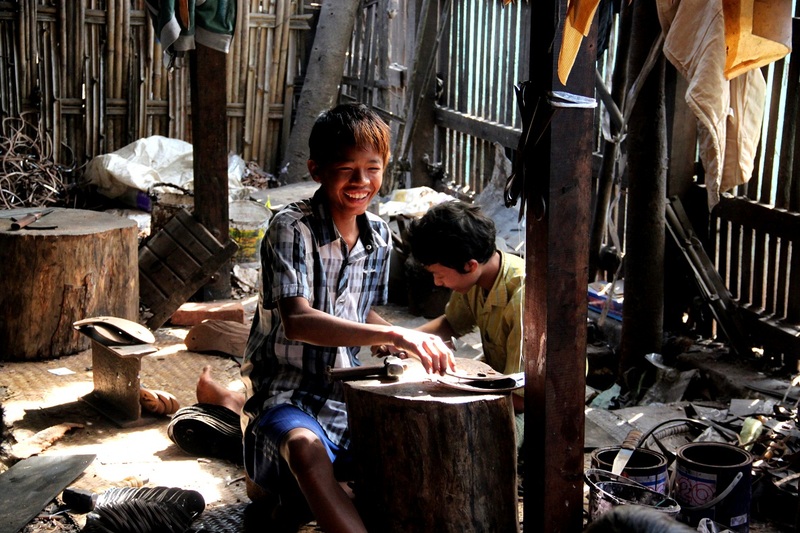 Visiting one of Pakokku’s bustling cheroot workshops, which are largely staffed by women young and old, is a must (for health reasons, the same can’t be said for smoking one…). Tobacco is Pakokku’s top trade item, along with an infinitely more expensive commodity: oil. The Yenangyaung oil fields were built in the 19th century during British colonial rule and have been operating almost continuously ever since. I say “almost” because a Japanese bomb destroyed the facility’s equipment during the Second World War, however it was up and running again almost immediately after the war’s eventual end. Pakokku is also well known for its local variety of thanakha, which is a distinctive yellowish paste made from ground bark and widely available at its markets. 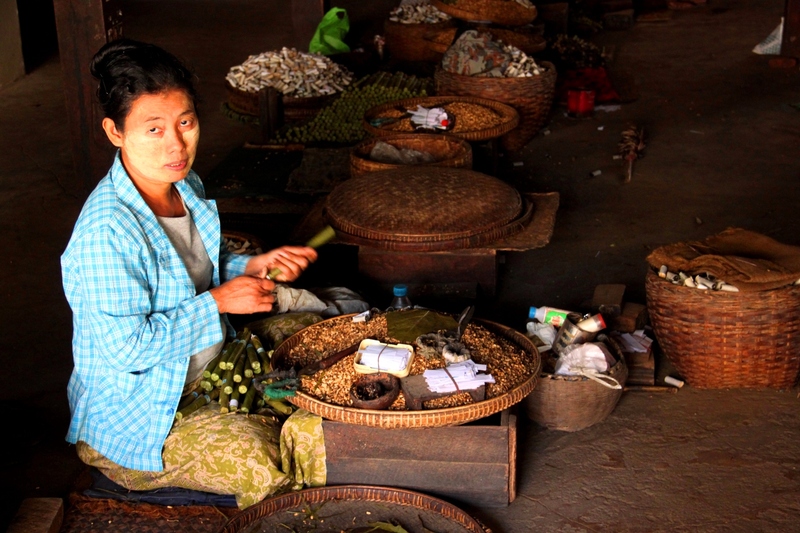 It’s wildly popular amongst men and women alike, as even the least observant visitor to Myanmar will attest. Thanakha has been used for centuries as a cosmetic (it highlights the cheekbones more boldly than any blush), but it also serves a practical purpose: protecting the skin from sunburn. It is also worn at night because its ability to reduce excessive oil (that is, blemishes) produces wondrous results (I’ve gone through several tubs of it!). 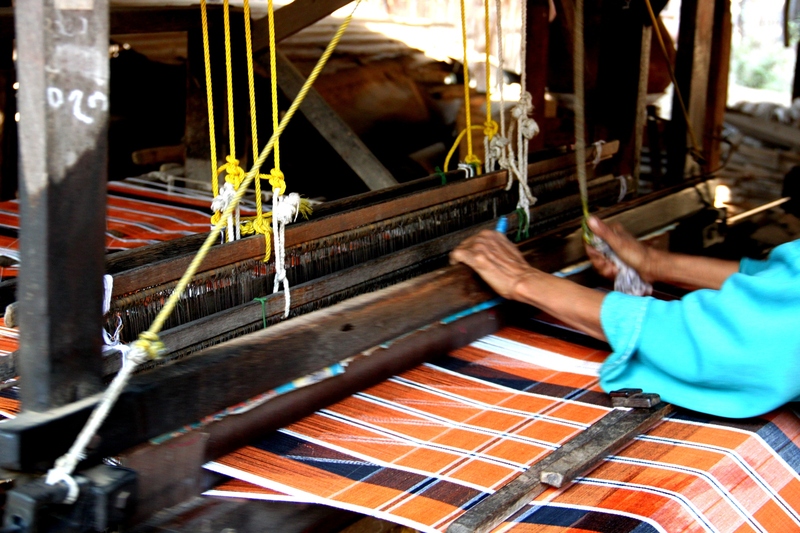 Agriculture aside, Pakkoku produces beautiful rattan furniture and home wares, velvet slippers and traditional silks, with market prices being infinitely better value than those in Bagan. There are also a number of slipper making factories – the buildings are nondescript but you’ll know you’ve stumbled upon one when you see row upon row of soles laid out the front to dry in the sun. I visited a few of these workhouses and was distressed to see several children labouring away. Pakokku has secured a place in Myanmar’s recent history that is unlikely ever to be forgotten. 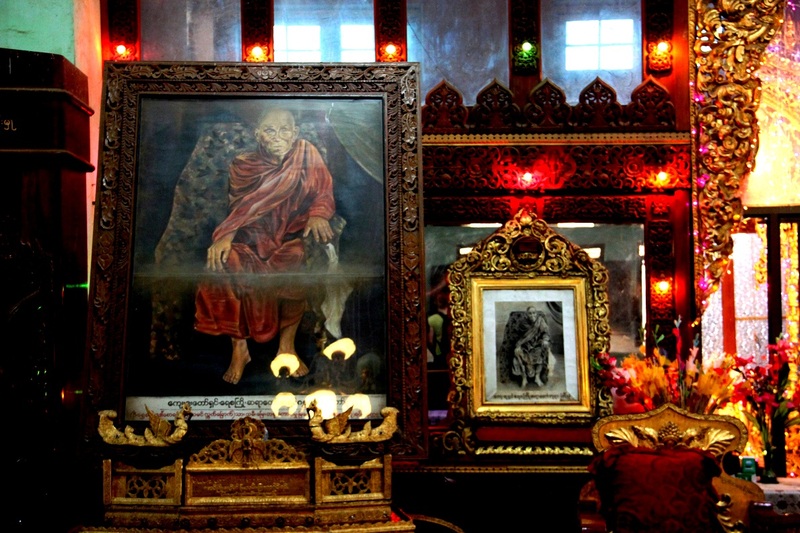 The dramatic events at Myo Ma Ahle Monastery in 2007 made international headlines and were arguably the impetus for fundamental political change in Myanmar. In protest against rising fuel prices, the monastery’s monks staged a demonstration, which ended in a violent crackdown by the authorities. Young monks retaliated by taking a number of government officials hostage, and when the deadline issued for an official apology from the government came and went, the number of protesting monks grew exponentially. Civilians in Buddhist majority Myanmar are highly respectful of monks and the affront to them led to nationwide protests. The monks’ demands expanded to include the release of all political prisoners, including global democracy icon Aung San Suu Kyi, who was still under house arrest. The entire movement was violently suppressed and democratic reforms were still half a decade off, but the courage of the Burmese people didn’t go unnoticed by the outside world. The reaction on social media sites led some pundits to claim that the Saffron Revolution gave birth to “open-sourced politics” in a wider sense. Paying a visit to Myo Ma Ahle Monastery is essential for anyone with a keen interest in Myanmar’s political reforms and its future. It’s possible to visit Myo Ma Ahle Monastery – having a driver will make locating it a whole lot easier than going it alone (as it’s certainly not the only monastery in Pakkokku!). Our driver didn’t speak much English and left us at the gate – although we were slightly hesitant about wandering around (there were no other tourists in sight), we were warmly welcomed inside the temple by a senior monk and he was even good enough to pose with us for photos (but sadly, we didn’t know enough Burmese to have a chat). On our way out, I saw a monk on a wooden balcony above and gestured to ask whether it was okay for me to take a photo of him. He said a few words in Burmese and sort of waved at me before dashing back inside the monastery. Just as I was saying: “I guess not…” to my husband, the monk reappeared. He was brandishing a smartphone and started snapping away at me! It was a nice moment. For those in Pakokku during either late May or the end of the June, experiencing the month-long Thiho Shin Pagoda festival is likely to become the highlight of your visit to Myanmar. The pagoda itself is the most famous in Pakokku and was built 800 years ago by King Alaungsithu during the Pagan dynasty. Every year it comes to life with traditional forms of entertainment, such as the musical plays drawn from Buddhist scriptures known as zat-pwe and the nha-par-thwar, a dance and song performed as a duet. Pakokku’s attractions are compact enough to be covered in half a day, but those able to spend a weekend there will be amply rewarded – its townspeople are extremely friendly and hospitable. However accommodation options remain limited, both in terms of quantity and amenities. At the 100-year-old Mya Yatanar Inn, guests can savour Grandma Mya Mya’s home-cooked meals, but less enjoyable is the fact that electricity isn’t available throughout the day (at best). Meanwhile, the pricier rooms at Tha Pye No Guesthouse include most mod cons, but the cheaper ones have been described as “cell-like.” Yet regardless of how much time a person is able or willing to spend in Pakokku, everyone is sure to leave with memories authentically Myanmar.